Well, it’s been a mint week riding my bike in Engadin St Moritz, with a crew of other bike-loving ladies! We’ve talked about everything from suspension to farting, ridden some great trails, eaten some delicious food, and above all I think we’ve all come away with a whole bunch of new friends. We were in St Moritz (yes, the famous ski resort in Switzerland) for the second annual Women’s Bike Summit. Last year was good, but if you ask me, this year was even better! We had some great skills sessions, including bike maintenance, suspension set-up, skills coaching, and some behind-the-scences coaching tips and tricks for those of us involved in actually delivering skills coaching. The weather wasn’t quite so kind to us this time around but we didn’t let it get us down. At least it wasn’t raining! It was just a bit chilly with some snow around up high. We kept warm with a little extra pedalling and some tactical route choices by our guides, who took us down to Poschiavo on the coldest day, known as “Little Italy” for it’s great food, coffee and gelato. It was also quite a bit warmer, and I almost got sunburnt before quickly slapping some sunscreen on.. oopsy! One of the highlights for me were the photo workshops with Sam Dugon. I took my SLR this year so that I could get involved. I love photography but I have huge swathes of time where I don’t get the camera out, so I always forget what I learnt last time. We were treated to a ride down Val Bever, where the scenery is so amazing that I’m not sure you could actually take a bad photo. We had some good clouds in the sky, not too much harsh sunlight and everyone was wearing bright clothes. British girls may like to moan about manufacturers making things in pink on the various forums, but I can tell you, European girls seem very happy pinking themselves to the max! It isn’t exactly a bad colour to be photographed in either. We also enjoyed an extremely polished talk on mental training from the very inspiring Anne-Marie Flammersfeld. She is an ultra-trail runner, and the world record holder for the fastest ascent up Kilimanjaro and back. She gave a very interesting talk on the power of the mind, covering things such as focus, relaxation techniques, and how to actually practice mental training. This is something I’ve always been interested in, and it was encouraging to learn that I’m on the right track with the way I use my mind to keep on pushing up tough climbs on the road bike, for example. Beautiful views up at Piz Nair. Maria taking it all in. Another highlight for me came on the morning of our first day. Specialized Ambassador Maria Frykman had come all the way from Innsbruck, and gave us some valuable information on how to help beginners feel more comfortable and confident riding their bikes. Whilst I don’t often guide beginners, I am really pleased to have been able to take away some very useful tips to help the people I guide to become even better riders. Above all, I really feel like I got to know some great women this week. Everyone was so happy to be out riding with other like-minded women. There is definitely a different vibe when you have a group of ladies riding together. A collective stoke when someone nails something you know they will have found hard or challenging. A collective sense of achievement when the whole group has finished a tough ride. 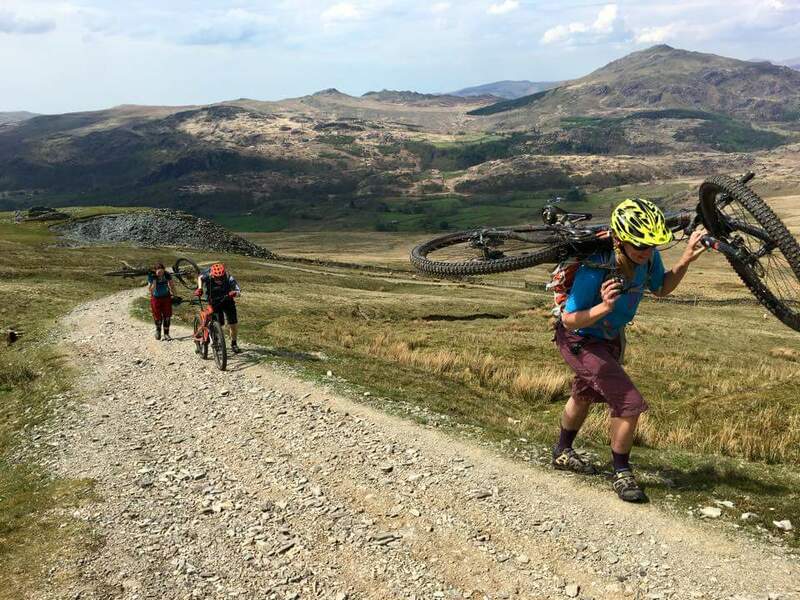 It seems to me that we tend to expect male riders to nail challenging stuff, and to finish a tough ride, these are norms, and they don’t get any praise for it. I like that within a group of female riders you have these responses. I guess we’re all just wearing our hearts on our sleeves a little more, we’re more vocal about cheering for each other. 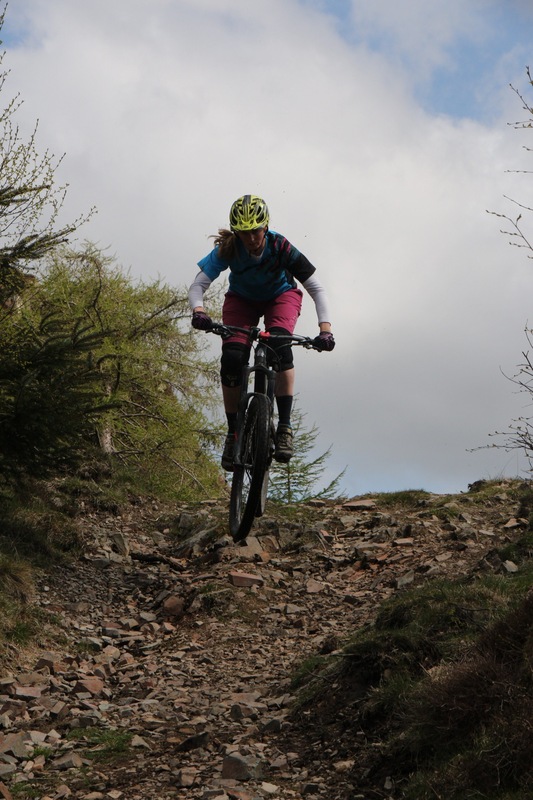 I could probably chatter on about that for a while without drawing any real conclusions, but instead I shall just say that if you’re a female rider reading this blog, you should really come along to the Women’s Bike Summit next year! You’ll ride in one of the most beautiful places around, learn so much, and make so many new friends! I couldn’t recommend it more. Day 4 was the day of the first puncture, and it didn’t even happen in anger! Actually, it was a bit of a mystery, a slow leak that seemed to emanate from the valve. Not long into the morning’s 12km climb, Pease and David stopped to try and sort it out. Rob and I continued, wanting to get the climb out of the way before it got really really hot (it was already quite hot after all). Along the way we were passed by some bikers on an uplift. This is only worth mentioning because they were in one of the new 4×4 Pandas, towing a great big bike trailer! Flippin’ brilliant! Ultimate uplift vehicle?? Maybe… if you had two to fit everyone in. We were on our way up the road towards the Sommet Bucher, seemingly very popular – we saw quite a few other riders, from middle aged folk on aging XC bikes, to more modern enduro style bikes and riders. Pease and David caught us up and we carried on up to a lovely little clearing with a fountain to refill our water bladders and take a well earnt rest. Today’s lunch treat was baked goods from the local boulangerie, and it was difficult to resist eating all of it at once! After a short while we decided we’d better head on as the weather forecast was suggesting storms later in the day. After a short push, we came to a fun undulating section and a very rideable piece of ever-so-slightly-ascending singletrack to the Col de Fromage. The landscape up there was incredible. All around us were high peaks, and beyond the col in the distance, even more layers of mountains, higher than us – still clad in the tatters of their winter coats. In fact, that is one of the striking things about the Queyras area for me. Up high, you often can see many many mountains. Lined up in rows, ranges stacked one behind the other. That’s quite a contrast to the views I’m used to up in Les Arcs. Here we can only really see one line of mountains at a time, because those behind are obscured by our high peaks. Second lunch at the Col de Fromage was despatched quickly, and there we met another rider who was coming the same way as us. On a solo mission, he darted off ahead and we only saw him once more after that. We were heading round to the Col des Estronques, and last time David and I did this, we dropped too low and had a lot of extra hike-a-bike. We made sure not to miss the junction this time and traversed round the hillside with only a little pushing. I was pleasantly surprised when all of a sudden we were at the signpost telling us it was only 0.6km to the col. Yippeee! Just like last time, it was blowing a hoolie at the top, so we didn’t hang around for long. This trail is quite loose and rocky up top and bottom, but with an absolutely fantastic middle section in a larch wood. I have to be honest and say, even on a second ride, that I am not too keen on this descent. If we could just leapfrog straight to the woods and straight to the bottom afterwards, that’d be great. However, I was in the minority as the boys absolutely loved it the whole way down. We popped out on the road just below St Veran, and now had a pedal up into the village to reach Les Gabelous, our accommodation for the night. The sky was looking more and more ominous but still no rain just yet. I spotted a sign for the gite, but it looked like the pedestrian access, so we kept on going. Reaching a hairpin, we had a moment of uncertainty and were about to roll down when we spotted another sign. At that very moment there was a huge clap of thunder and some very very big hail stones started to fall. Immediately everyone sprinted as hard as they could up the hill and into the garden of the gite, hail getting harder as we did so. Throwing the bikes to the ground, we got indoors as quickly as we could! Talk about absolutely perfect timing. High Fives all round. Another wicked day had come to an end, and our accommodation for the night was brilliant. It was a quaint old place, a bit of a rabbit warren in fact. Full of character, it was quite easy to get lost! Beers were swiftly ordered up, the games collection consulted, and a most competitive game of Uno kept us occupied until dinner. If you’re going to St Veran, I would highly recommend a stay at Les Gabelous. The next morning we were away early again, as more storms were threatened that afternoon. We had a fair bit of ascent on the cards for today, first 300m to gain on a road, then 500m pushing, followed by another 300m of hike-a-bike. However, this day also promised to be the best day of the trip – the final descent is well renowned, and I for one was keen to see what all the fuss is about. Getting the pedal out of the way (and passing an old bronze mine – complete with abandoned generators), we were soon on the footpath up to the Col de Chamoussiere. This gentle ascending trail was more of a push than a carry with many short rideable sections. It seemed the week’s activity was catching up with me as my progress was very very steady and the boys were well ahead! Nevertheless, with the beautiful valley and pretty streams to admire, it was a very pleasant morning. Finally reaching the col, an absolutely stunning view awaited. Pease had set the camera up to get all four of us in shot on a small ridgeline with an incredible backdrop. It had been difficult to establish exactly what our next trail would be like because the contour lines on the map were obscured by the scree also drawn on it.. now was the moment of truth! I explained to the others that we’d shortly be hooking a right to climb back up to the road. At that moment we spotted the refuge d’Agnel in the distance, and someone suggested that actually we may as well go down there for a coffee and ride up the road – it’d be just as easy. A coffee??? OOOOH YES PLEASE! Now this trail may be one of those marmite trails. I didn’t get the impression the others liked it much, but it was rather stop-start due to sections of snow that needed crossing. That always ruins the flow a bit. I personally thought it was mint, and I’d certainly like to give it another go without the snow. It was a little undulating to start with, with some great rocky techy challenges. The final section down to the refuge was an absolute delight. So fast. So flowy. SO.MUCH.FUN! We were buzzing! Col d’Agnel is right on the border between France and Italy, and is the second highest road pass in France (behind Col de l’Iseran, up above Val d’Isere). As you can imagine, there were plenty of cyclists up there taking photos next to the very cool retro border marker. We found ourselves an excellent spot for lunch and tucked into the sandwiches made for us by the ladies at the Gite Les Gabelous. They were delicious! Even so, when I pulled out that bottle of Andalouise sauce I’d been carrying around all week, no one turned it down. YUM YUM YUM! Keeping an eye on the sky, we could see dark storm clouds building, and decided we’d better crack on. The final 300m ascent in the whole trip – YES! Just above Col Vieux, we were stood atop the final descent. We couldn’t even see it all – stretching a long long way down the valley ahead of us, we could only just about make out the trail disappearing off into the distance. Pretty quickly we found ourselves riding down a trail masquerading as a river. Whoever was in front of me was going quite steadily – perhaps so as not to get too wet and muddy, but there was no avoiding it. I over took and got on with it – after all, more speed = more fun! There were some patches of snow to negotiate, and we just barrelled into them hoping for the best.. All good! We passed two beautiful lakes, so still, perfect reflections of the big clouds above. By now I had Rob ahead of me. Rapid on a bike at the best of times, he was hitting stuff super-fast. Keeping up as best I could, getting a bit loose here and there, it was awesome. Fast fast fast! Past the second lake the trail became better than ever. I can’t even really describe it! We were just going so fast. Remember those times smashing a trail with your friends, everyone whooping and hollering, just having the best time?! It was like that. Smashing turns. Ooooh, a bit of a moment! S’ok, rode it out! YEOWWW! Just a mere 9 years after getting my first guiding qualification, I’m very proud to be able to call myself a British Cycling Level 3 MTB Leader. That means I can guide people on mountain bikes anywhere in Europe (with the exception of France, for now. More on that another day), and for us Brits, it can be described as the gold standard in guiding. Hooray! I actually did the training for the old Mountain Bike Leader (MBL) qualification right after my first season in 2007 but life took a different course for a few years so I never did the assessment. Fast forward to 2011, and I was back in the mountains working as a guide, and again in 2012, 2013 and 2014.. Not surprisingly my experience and quality as a guide now well outstripped my original qualification! Then last summer I had the opportunity to go on the training course for the new MBL equivalent, the British Cycling Level 3 MTB Leader Award. Bit of a mouthful eh! The training course with Cyclewise was brilliant. Even after all the summers of guiding I’d done, I still got plenty out of it and went away with some good feedback and a few cool new things to think about. Of course, it was also enhanced by the chance to enjoy some good riding and banter with Rich & Craig, Cyclewise head shredders. The months ticked past until last weekend it was time to head back to the Lake District for assessment. I took the opportunity to spend a few extra days riding in the area as being based in France, it’s become a rare treat. Luckily the weather was well and truly on point, so much so that by the end of my new bike’s first week, I’d covered over 200km on it! Saturday rolled around and I was quite nervous entering the classroom where we’d start the weekend. I knew I could do the do, but was worried about making some sort of silly elementary mistake which would result in a fail. First up was checking mechanics skills, luckily one of my strong points as I’ve always done all my own bike maintenance and fixing. Just what I needed to help put me at ease. After lunch it was navigation test time. I don’t struggle with this, but in a pressurized situation, you know, a bit like the test I was on, I’m slightly lacking in confidence. Fortunately a few very intensive days of nav practice beforehand had helped with the confidence and I took us to all the right places! By the end of Saturday I’d gone from feeling a little nervous and apprehensive to totally looking forward to Sunday’s riding. 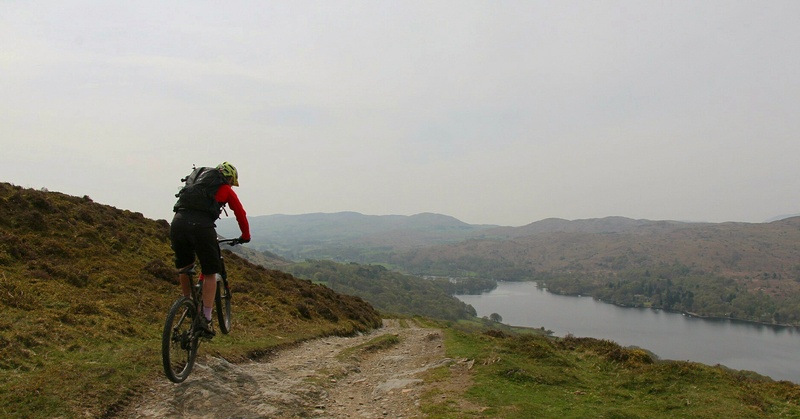 We’d ridden some excellent trails and seen some stunning views and there was only going to be more of the same. All day Sunday was spent guiding. There were three of us on the test and we had two real life folk to guide, one of whom was a local lass called Rachel who I’d read about and was really excited to meet – I still rarely get to ride with good female riders, and feel like I’m totally missing out on everything going on in the UK, like the Hope Tech Women’s rides for example. This bit I was not at all concerned about, just needed to be on my best guiding behaviour. There were one or two things which I could’ve done better (and being knackered after 5 days on the bike definitely did not help, there was some mental fortitude required to look more energetic than I felt on Sunday!) but I got some really nice feedback from our guinea pig clients, Rach and Giles, both directly and through our assessor Rich. Happy days 🙂 . So that’s it! I passed, and I’m really excited that I can take people biking in rad places now without having to be working through a chalet company… Where do you want to go? ?